Dan Barrett and Tim Macuga’s original gloom-filled masterpiece deathconsciousness managed to pique the interest of the collective interweb persona back in 2008, where an eager audience received the monolithic double-release with a certain trepidatious appreciation. Inaccessible to many thanks to the duo’s characteristically abject bleakness and startlingly desolate atmosphere, it went on to become an instant classic among the cult following that did manage to break through its considerable inscrutability. Six years down the track, Barrett’s efforts with label ‘Enemies List’ and its associated side projects resulted in the full time investment of the charismatic Connecticut resident into its further maturation. In retrospect, it was perhaps the release of deathconsciousness that went on to represent for many what is not only now a classic record, but also the marking of the beginning of the wider enemies list musical ideology. While intentions where focused elsewhere for some time, fans where teased in late 2010 with the fantastic Time Of Land EP. With a refinement of the original formula displayed fleetingly across its four tracks, fans held their breath waiting for what Dan and Tim would come up with for the newest full-length installment. Given this background, it was of course only natural that the follow up to the much-revered debut would be met with some degree of anticipation. After what had undoubtedly been a burgeoning time frame for those involved since the initial release, it can be said joyfully that the changes, growths and analogues to be found on The Unnatural World present a myriad of new and engaging ideas across its (comparably short) run time. In many ways, the characteristic Have A Nice Life sound is left relatively unscathed. The dark, omnipresent, processed drum machines, Barrett’s distinctive ability for crafting memorable melodic passages, as well as the crushing, heavy dynamic shifts that were found so prevalently in the second movement of deathconsciousness. Though that is not to say that nothing new has been added - but only that the most recognisable distinctions of the duo have been left in place, in order to provide a more coherent framework for the experimentation that goes on across the 50-minute-odd runtime. And experimentation is perhaps the most apt description. Although it does away with the stifling desolation that seemed to embody the latter half of the debut, the gloom and loneliness of the new LP runs deeper and less apparent than before, permeating through each track as more of a mere reminder rather than as a definition of the work. That being said, the overall austerity that was found on the preceding release is somewhat diminished here, via the much clearer production that it achieves in comparison to its predecessor. This is as well as the more fervent first movement at first appearing to take away from the overall solemness of the affair, which can admittedly serve as startling to some degree upon the initial hearing. Despite the almost upbeat flavouring of preliminaries such as "Defenestration Song" or "Burial Society", it is their placement among the likes of the more contemplative pieces that allow the listener to cherish their presence, rather than become bored with a singular level of such consistent intensity. In fact, it is the slow, calculated disintegration of the compositional structural integrity of each track that serves to really characterise what The Unnatural World achieves as a work. Barrett and Macuga labour to effectively draw the listeners in from the get go, and slowly but surely inch them down into an unseen mire of despair; that by the end of the record succeeds in fastening an ineluctably tight hold. The original release for me personally took over a year of repeated listens, in order to attain full appreciation for what was being demonstrated. What Have A Nice Life have accomplished on The Unnatural World is, from what can be so far told, at a very similar level of subtle, wilful coordination. While not as substantial of a work as the original in terms of sheer magnitude, the immediate accessibility upon even the first initial listen creates even further contrast. However, I trust greatly that there are a number of elements on this new record that have evaded me since its only recent release – especially considering how long the debut took to grow on myself and many others in terms of full appreciation. Nonetheless, what can be heard on the new LP is nothing short of impressive, especially from under the shadow of its formidable progenitor. 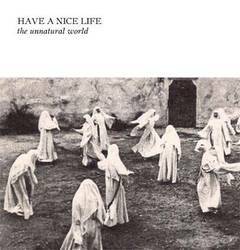 While The Unnatural World may not have quite the same weighty, emotional impact of the original, it represents an almost perfect refinement of the still highly interesting Have A Nice Life identity. Posted Feb. 24, 2014, 8:36 p.m.